The Greeks contend a great way to entertain is to serve a meze spread. This idea of providing a little nosh to all who drop in is the inspiration for noted cook and culinary teacher Diane Kochilas'latest cookbook, "Meze: Small Plates To Savor And Share From The Mediterranean Table." 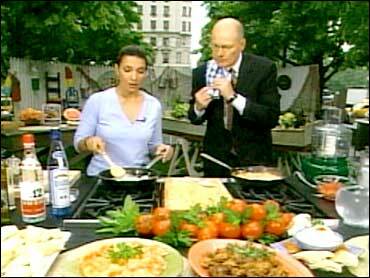 She visits The Early Show to share the traditions and tastes of the meze table - small dishes of food served in the middle of the day over which conversation and drinks can be had. Kochilas is quick to note that meze are appetizers. They are not tapas, nor are they a dish that immediately precedes a main meal. Meze (mezze, maza, meza) means "middle of the day," or between lunch and dinner. In her book, Kochilas explains, "Mezethes are almost always meant to play second fiddle to the drink at hand...In Greece, where there is a long history of viticulture, there are mezethes that are meant to accompany wines and others that match better with stronger drinks, such as ouzo or raki." Of course, the rules are very fluid so any combination of either three drinks, alone or in combination, may grace the table. When meze is served, the focus is not on the meze itself, it's on what's going on around the meze (fun, conversation, drinking etc.). Kochilas writes, "Mezethes have to have a certain snappy spirit. There are lots of wrapped, individual dishes; small hand-held pies; spicy, robust dips; crunchy fried foods; luscious baked dishes oozing with melted cheese; garlicky seafood and aromatic grilled meats. For an American cook, mezethes make perfect party food, excellent brunch fare, and natural offerings for buffet feasts." The 80 recipes in "Meze" - Kochilas's fourth cookbook - cover the range of meze fare. Most are traditional Greek while others are from Turkish and Lebanese cuisine. The author says all recipes are accessible and can be prepared in American kitchens. Unlike her earlier book ("The Glorious Foods of Greece"), which took 10 years to write, "Meze" came together in about a year and a half. What Kochilas loves about meze is, "it's one of the best ways to eat. One of the best things about Greek food. Greeks are very social and this is the way most Greeks love to eat. It's enough of an invitation not to want to get up and go anywhere for a while." There is this great bustling taverna in one of the northern Athenian suburbs near where we live, and this is the house special, so much so that the chef refused to give me a recipe for it. So I deconstructed it myself only to re-create it pretty much intact. The tomatoes, cream and ouzo make a great sauce. You could easily make a quantity and serve it over pasta. It would look and taste good with squid-ink linguine. Using a sharp paring knife, remove the threadlike vein from the shrimp. Wash, drain, sprinkle with lemon juice, and set aside in the refrigerator until ready to use. Heat 2 tablespoons of the butter in a large skillet. When the butter stops bubbling, add the onion and cook over medium-low heat until very soft, or 10 to 12 minutes. Add the garlic and stir for a minute or so. While the onion is cooking, pulverize the tomatoes in a food processor until smooth. Add them to the skillet. Cook the tomato-onion mixture over medium heat until thick, about 8 minutes. Add the ouzo and let simmer for another 3 minutes. Drain the shrimp and add them to the skillet. Simmer for about 4 minutes, or until the shrimp firm up and turn pink. Add the cream, season with salt and pepper, and stir well but gently to combine. Just before removing from the heat, add the last dab of butter. Serve hot. This is one of my favorite combinations in the world. The origin of the dish is Turkish, but it is found in Greece, a rare treat almost always prepared by Anatolian Greek cooks. It is a wonderful accompaniment to kebabs and meatballs. Combine all the ingredients in a serving bowl and chill for 1 hour, covered. Serve immediately. Seek out the sweet watermelon and Dodoni feta. You can find the latter in most Greek and Middle Eastern food shops as well as in speciality cheese emporiums. The feta from Dodoni in Epirus has a firm, creamy texture and can be cut into cubes without crumbing. Dampen the bread under running water and then hold it over the sink for the water to drip off. Break into chunks, about 1-inch each. Place the chunks on the bottom of a serving bowl and sprinkle half the onion slices over them. Place the watermelon and any of its juices together with the feta cubes on top. Drizzle with vinegar and toss gently, careful not to mash the watermelon. Season with pepper and garnish with the remaining onion slices with mint. Serve. Diane Kochilas, a native New Yorker of Greek descent who adopted Athens as her home in the early 1990s, is one of the foremost international authorities on Greek cuisine and food culture. In her previous, critically acclaimed book, "The Glorious Foods of Greece" (William Morrow 2001), Kochilas documented the regional cooking, culinary traditions, and local food products of Greece, spending nearly a decade traversing the length and breadth of the country to do so. Τhe book was commended in the New York Times, and Publishers' Weekly among other publications. Kochilas wears many related hats: She is a journalist, cook, and culinary teacher, as well as a restaurant consultant and culinary travel guide, having recently embarked on organizing both professional and recreational food trips throughout Greece. For the last eight years, she has been the fearless -and feared (! )- restaurant critic for Greece's largest daily newspaper, Ta Nea, as well as the paper's weekly food columnist, covering everything from chefs and recipes to pertinent food-related issues. Abroad, her work has appeared in many publications, including The New York Times, Gourmet, Saveur, and Food & Wine. Diane divides her time between Athens and the two islands she loves: Manhattan and Ikaria.